The savannah monitor (Varanus exanthematicus) is a lizard native to sub-Saharan Africa, north of the equator. Its range stretches from west and central Africa through to the area of southwestern Ethiopia and northwestern Kenya. The savannah monitor is also known as the tree leguaan or Bosc’s monitor lizard, after French scientist Louis Bosc who first described the lizard in 1792. Did you know that the savannah monitor is related to the komodo dragon, which is the largest lizard in the world? The komodo dragon is actually a type of monitor and is in same genus (Varanus) as the savannah monitor. As their name suggests, wild savannah monitors are found mostly in the African savannah, which is an open grassland sparsely populated by trees. Wild savannah monitors can also be found in some agricultural areas within the savannah belt. But they are not commonly found at elevations higher than 800 metres above sea level. Savannah monitors are stoutly built reptiles with wide heads, thick necks, long powerful tails and short muscular limbs. Adult savannah monitors can grow to a maximum length of 4.5 feet (1.3 metres) and weigh up to 150 lbs (70 kg). 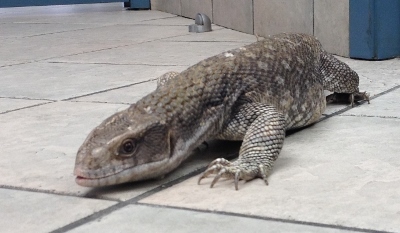 Savannah monitors have thick skin with scales that look like flat pebbles. They are usually a dark tan or grey colour with lighter tan or grey bellies. In the wild, the main predators of savannah monitors include humans, birds of prey and large snakes. In some west African countries, savannah monitors are used in traditional medicine and hunted for food. Savannah monitors are also exploited in the pet trade and for their skin. In order to scare off predators, savannah monitors will hiss loudly and inflate their throats. They will also lash out against a threatening presence with their powerful tails. In the wild, savannah monitors live about 8-to-10 years. In captivity and with proper care, they can live between 15 and 20 years. In captivity, savannah monitors can be quite tame, but they need to be socialized consistently in order to become used to being handled by people. To tame a savannah monitor in captivity, it’s important to gently handle him when he’s young every day so he gets used to be handled and learns that his human family members aren’t a threat to him.